PLEASE NOTE: These instructions might seem a bit confusing but they are literally step by step. In a nutshell: You’ll be making sweet tea by bringing water to a boil, and carefully adding/stirring in sugar, then adding tea bags. Once this mixture has completely cooled, the tea bags are removed and the tea should be moved to a clean, glass jar. Add the SCOBY, a small amount of Kombucha from your previous batch (optional–this only makes it ferment faster) and secure a clean tea towel or paper towel over the top. The towel is there to keep out bugs, molds, etc., yet let oxygen in. Place water into a pot and bring to a boil. Tie bags together for easier removal later. Once water comes to a boil, remove from heat. Carefully and SLOWLY add sugar; stir. (If sugar is not added slowly, it can cause the water to overflow!!!) Make certain sugar dissolves and does not sit on the bottom of the pot. 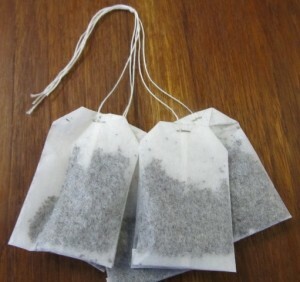 Add organic tea bags; push down into water with spoon. Allow this sweet-tea mixture to completely cool to room temperature. Put tea into the appropriate-size glass jar. Tightly cover jar with paper towel, coffee filter, or dish towel and secure with rubber band or string. Let tea sit in a dark area (or cover with brown paper bag open at both ends). Fermenting will take about 4 to 10 days depending on temperature. Taste test and/or use pH strip to see if Kombucha is finished fermenting. According to Westonprice.org, glucuronic acid is at its highest at 2.6 pH. When finished fermenting, bottle Kombucha in glass jars, tightly cap and store in refrigerator. NOTE: Room temperature affects fermenting time - it ferments faster in warmer temperature. There will usually be a nice, new SCOBY on top when Kombucha is ready. Save this for the next batch or share with friends. Place SCOBY in a jar with new sweet tea and store, tightly capped, in refrigerator if not immediately reusing. Do not allow the SCOBY to touch metal other than stainless steel, and do not store Kombucha or SCOBY in metal or plastic. Kombucha will continue to ferment when not refrigerated and can ferment even while in refrigerator. 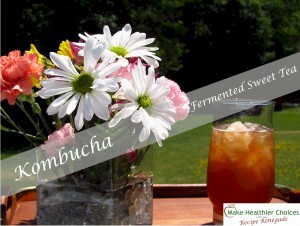 Kombucha is effervescent and becomes more carbonated when not refrigerated. NEVER shake, and remember that Kombucha can explode. Kombucha can contain a small amount of alcohol. Check with your doctor before drinking or eating any fermented food. Don’t worry if your jar isn’t quite big enough to hold the tea, starter Kombucha, and SCOBY. It’s okay to drink any leftover sweet tea that dosn’t fit. Make sure you save some finished Kombucha as a starter for the next batch. Some people ferment their tea much longer than the 4 to 10 days. I personally don’t like how it tastes going any longer than 10 days. Sometimes in the summer, mine will ferment in only 4 days. I’ve made many batches of vinegar! BLECK! How to do a Second Ferment 2f.